October is Disability Employment Awareness Month! Click here to view the SC’s Governor’s Proclamation that declares October 2015, as Disability Employment Awareness Month throughout the state. This proclamation encourages all South Carolinians to identify barriers to employment for persons with disabilities, and to continue to work toward improvements to ensure a competitive wage in an integrated environment for all South Carolina’s citizens. 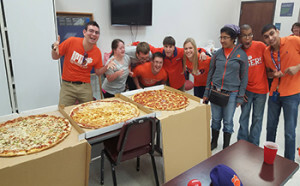 SC Works and ClemsonLIFE, a program of Clemson University for those with disabilities, collaborated together as part of the Disability Employment Awareness Month in October of 2015. ClemsonLIFE coordinates courses of study that includes career exploration and preparation along with self-awareness, discovery and personal improvement through a framework of courses, job internships, and community participation. The students become self-sufficient young adults by learning about employment and independent living while developing social, leisure, and health and wellness skills. As part of the collaboration with SC Works, ClemsonLIFE students participated in interviewing workshops, developing resumes, and touring the SC Works office. Click here for full article featured the Seneca Journal. Students must answer this question as they develop Individual Graduation Plans required by the Education and Economic Development Act, a process that includes selecting a field of study or a career cluster to guide their academic studies. The sponsored event partnerships are with Anderson County Economic Development, Oconee County Economic Development Commission, Alliance Pickens, local businesses, Tri-County Regional Education Center, and the school districts in Anderson, Oconee and Pickens Counties. The Showcase expanded on the success of the Industrial Product Showcase organized annually by the Oconee County Industrial Group (OCIG) to showcase the products made by local companies and to inform citizens about the importance of manufacturing.